Origin and Habitat: Type Locality 45 km South-South-West of Kimberley, South Africa. 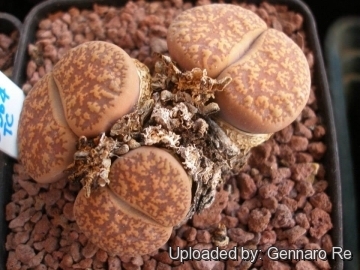 Description: Lithops lesliei var. 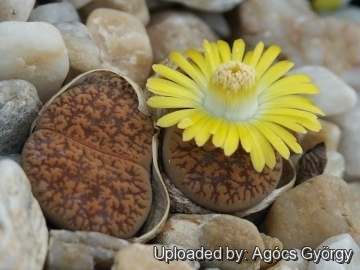 hornii is one of the local form of the very variable Lithops lesliei that differs in a number of colour characters, but not sufficiently differentiated and often considered merely a local variant of the latter (if not the same). Its faces typically displays an orangish-brown or pinkish-brown colouring with coarser, irregular and relatively opaque designs, and seems a brown coloured var. venteri. 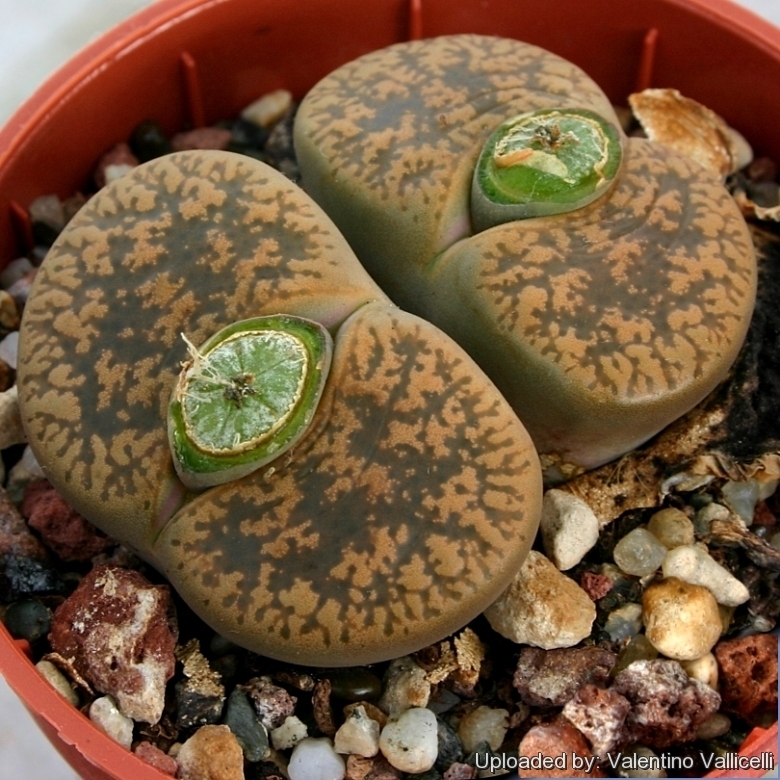 Bodies (paired leaves): Medium-large, rounded from above, profile truncated, top of lobes elliptic-reniform, flat, smooth, sometimes slightly convex; sides coloured purple-grey, brownish or green; windows always present, rarely ridged or fully open, dark-green, consisting of small irregular, extremely variable confluent areas; densely or sparsely covered with orangish-brown or pinkish-brown irregular projections from the slightly raised margins; in these projections small round dark openings; outer margin distinct but very irregular, sonic laciniae being very short, others projecting into the window; inner margin nearly straight or provided with obtuse very short lobes, giving the whole margin a wavy appearance; on outer edge of the margins few or many irregular distributed more or less circular windows. Desmond Cole field number C364: This population distinguishes for having rusty-brown leaves.